Last month, I ran a one-day workshop for senior leaders at a multinational organisation. One of the common themes that came up when we were establishing the ground rules for the session was the sense of �busyness� in the group. Many participants mentioned how �busy� they were and how it was not an ideal time for a full day workshop. Nevertheless, the workshop went very well and the level of input and engagement from the participants was high. As a follow-up, I was debriefing the workshop with the participants yesterday. Their feedback about the session and its impact has been very insightful. One participant said she appreciated the time and space the session provided in order for her to slow down, think and reflect. She was able to move out of her �tactics� mindset and think more strategically. Another participant mentioned that he was able to step into a more strategic mindset and use the time to think about frameworks that will find alignment with everyone in his team. Others shared similar experiences. Participants realised that they were actually being busy for �busyness� sake, whereas what they were missing was the necessary time and space for valuable strategic thinking and consequently future planning. This is a key aspect of leadership. As Henry David Thoreau wisely stated, �It is not enough to be busy� the question is: what are we busy about?� Strategic thinking examines and challenges the assumptions that exist around an organisation�s value proposition. It focuses on finding and developing unique opportunities to create value for an organisation. Being a strategic thinker can be difficult, but allocating time for the process is a crucial first step. Reflect � Make a commitment to slow down and do some focused thinking. One easy way to do this is to schedule a time every day or week to simply spend time thinking. It doesn�t have to be at work; it could be driving to work or going for a walk at lunch. Broaden your horizons - Strategic thinking and curiosity are intrinsically linked. The more ideas and experiences you have, the more insights and connections you can make. Try to read about new ideas or new opinions, or explore new places to help stimulate the mind. Step into others� shoes � Discuss your ideas with other people. This is valuable because most likely the people around you think differently from you and can provide alternative perspectives to your ideas. Clients and customers also serve as a good source of inspiration for new ways of thinking. Encourage others � The more strategic minds generating ideas in an organisation, the better. One effective way to encourage staff to think strategically is to incorporate strategic thinking into their training and/or performance development plans. Make decisions � Strategy is not just about thinking, it is also about executing. Generating ideas is valuable, but it can go to waste if a decision is not make about what to do with them. This is where budgeting, time, money, resources, and prioritising come into focus. Strategic thinking will make you a better leader. However, the ultimate value of strategic thinking is that it is looking out for the future of your organisation and its long-term success. Newsletter Reader Question: I recently started working with a new client and have been having a few issues getting clear feedback about our progress. I am asking the questions, but simply not getting the practical/useful responses that I am after. How can I improve this situation? When it comes to asking questions in order to prompt useful responses, I have found one important technique is to �extrovert your thinking�. This is a technique that I actually learned from a client. When we frame a question we should always try to externalise our thinking. Often times we ask a question believing it is clear and concise, and that our audience will interpret it as we want them to. However, this is not always the case, particularly if we are dealing with a new relationship or new client who we have not had a chance to establish a solid rapport with yet. Soliciting useful feedback is not a straight-forward or easy process. We must always try to be conscious that our rationale for asking a certain question is also evident to and aligned with our audience. If we keep these relevant thoughts to ourselves, we can�t expect our audience to read our minds. 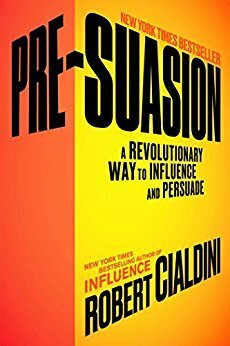 Pre-Suasion: A Revolutionary Way to Influence and Persuade, Robert Cialdini, Ph.D.
Dr. Robert Cialdini has spent his entire career researching the science of influence earning him a reputation as an expert in the fields of persuasion, compliance and negotiation. I have followed the work of Dr. Robert Cialdini for many years and recently attended a seminar, here in Melbourne, featuring Dr. Cialdini called �The Power of Influence and Persuasion�. I found his new book to be a fascinating read on cultivating success as a communicator. In his new book, Dr Cialdini delves in the mechanisms of effective persuasion and reveals that the key to optimal persuasion lies not in the message being delivered, but rather in the moments before the message is delivered. He brings his trademark scientific research to the fore as he posits how this �privileged moment for change� prepares people to be receptive to a message before they experience it. This concept is known as pre-suasion. Pre-Suasion outlines the techniques a person should implement to become a master persuader. These techniques do not involve the typical attempts to alter your audience�s attitudes or beliefs, but rather revolve around the process of redirecting your audience�s focus of attention. The book draws on an array of studies and narratives, including advertising imagery, the annual letters of successful multinationals and lessons from history, to illustrate that the art of successful persuasion ultimately comes down to an ability to prime your target audience.